Terry has been coaching people to train their dogs since 1966. 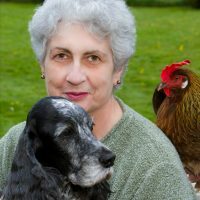 She trained her own dogs for various performance events and was an AKC obedience trial judge for many years. She built and operated a large training complex in Washington State. Legacy Canine Behavior & Training, Inc. promotes humane and effective dog training techniques for a variety of pet, working dog, and competitive applications. Terry maintains a busy national and international workshop schedule. Most frequently teaching instructor’s courses, chicken training workshops, and training games events. 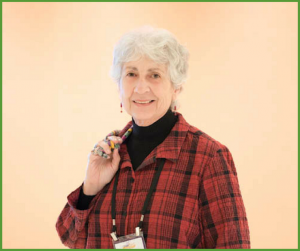 Terry is a faculty member of the Karen Pryor Academy, teaching several classes a year in the USA and overseas and she is on the staff of Clicker Expo. I appreciate you taking the time to listen and share these offerings. I also enjoyed the podcast! Re: the intro of the clicker, I do find interesting Terry’s mention of a reading a paper that attributes clickers being used by the American armed forces (though her description doesn’t really sound like it has anything to do with conditioning, just with communication in code). It would be great to find out the exact reference and read the paper. “The Brelands coined the term “bridging stimulus” in the 1940s to refer to the function of a secondary reinforcer such as a whistle or click. ABE continued operations until 1990, with the assistance of Bob Bailey after Keller Breland died in 1965. They report having trained over 15,000 animals and over 150 species during their time in operation. This storyline suggests the Brelands were first to use the ‘click’ noise first for the operant conditioning of animals, and that the “cricket party favour” or the actual mass produced clickers were popularized by Karen Pryor and Gary Wilkes. I should correct my comment: the Brelands coined the term bridging stimulus, and applied it to animal training, but “invention” is not the right word! She had been invited to talk at the ABA conference and instead of doing a lecture, she decided to do it as a panel. One person that she invited was Gary Wilkes, who was a dog trainer who had met Karen at a demo at a dog shelter. Because of Karen, Gary adopted the idea of a marker and reward style of training. Karen, at the time, used whistles, as that was what was in use in the marine mammal world. Gary pointed out that whistles would be confusing to dog trainers because they used whistles in different ways. Before the ABA talk, Gary happened to see a box clicker that was a giveaway promotion for a company. Perhaps that could be used instead of a whistle? Karen thought it a great idea, bought 200 of them, and handed them out at the ABA talk and subsequent dog training events. The internet was just getting going at this point and word spread. The clicker, as the marker of choice for dog trainers, was adopted. Sorry to swerve this conversation away from the excellent conversation with Terry Ryan! But you know how behavior geeks are 🙂 I’ve been delving deeper into the history of the clicker. Can you edit my comment? Terry Ryan was not “incorrect”. I apologize! Skinner used many bridges, including what he called a “cricket.” He even wrote an article espousing the use of it for pet dog training. The Brelands also used various markers. But this story shows the many paths it takes for science to reach the public AND to be utilized. Utilized correctly is another story 🙂 Karen Pryor originally used a whistle because that made the most sense for training marine mammals. (Side note, there were other bridges, like underwater electronic sounds.) Her use of the clicker for dog training was serendipity, not a direct line from the scientists before her. It was, however, based on science and the research that started with Skinner.